Our solution portfolio focuses on functions to improve the quality of planning in production and the supply chain. There is often a fluid transition from planning to the actual production execution in the workshop or at the manufacturing line. In addition, any scheduled or unscheduled production activity can influence the planning situation and require the intervention of the planner. Therefore, a complete separation of planning and execution is not mandatory. In general, features for planning and execution are strictly separated. In many scenarios, this is dictated by a separation of the responsibilities. But it can be useful to carry out both activities on the same or on a similar platform. It is easier to find and edit the correct order to be confirmed with a tool that offers a transparent overview of the planning situation (e.g. the exact sequence of scheduled orders on a production line). This is particularly useful when planned values are also used for the confirmation, for instance in backflushing. If the planned figures accurately reflect the reality then actual activities can be equated with planned activities to spare the high costs of entering every deviation in detail. The material staging can be regarded as the final step of planning. Despite a feasible sequence in the detailed planning with component availability checked on stock, shortfalls in the material supply to the production site can still occur during execution. 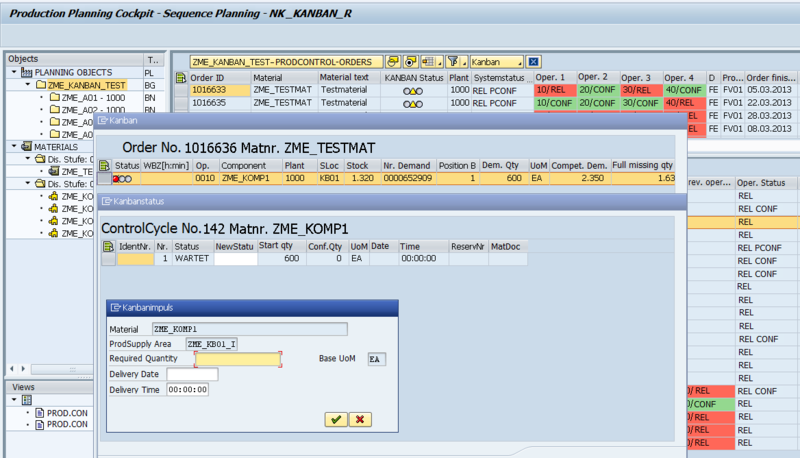 Making such cases transparent and drawing consequences for planning (in this case the change of the order sequence) is vital for sustaining a production without unnecessary delays. An important aspect is the easy handling of the module: the staging of a material is triggered from the planning representation (order sequence) through a simple click or with a few intuitive steps. The user benefits as well from easy accessible information about existing control loops that specify the supply location and type. 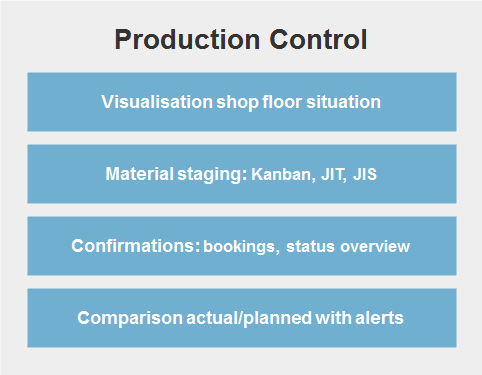 The material staging by kanban control according to the just-in-time/just-in-sequence principle is effectively performed with the PPC Production Control. Key figures are determined dynamically. For example, the range of available components for capital binding stocks in production is recalculated with a change of sequence. In the comparison of planned and actual data, the effects of plan variations for activities of the orders as yet to be performed are established. 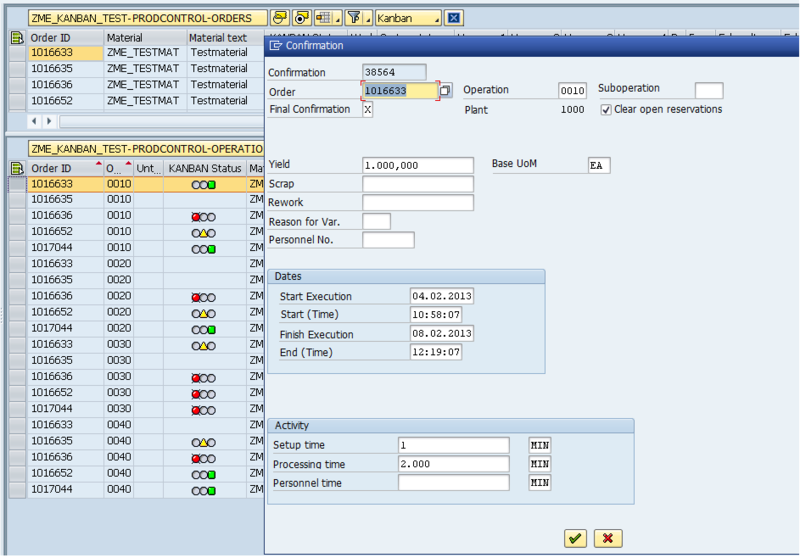 Which orders are scheduled next on which production lines/work centres? What is the work progress of the orders and which confirmations have been booked? Are the orders up to now included in the production plan or have there been variations that influence further production (e.g. the orders already processed had excessive scrap or delays)? If not: Which components must be transferred and how will they be provided? Are problems during the material staging expected (e.g. stock too low, components at wrong storage location)?